Blog of the Week: Dreams Awaken! Fun, beautiful, playful and a self-confessed aficionada of Hello Kitty—introducing Valerie, also known as Princess Miharu, the latest Blog of the Week Winner! Princess Miharu, authored by the blogger who has the same monicker as the blog title, has been around for years as a haven for Hello Kitty collectors, fashionistas, and for those who love going on food trips! Princess Miharu has an excellent fashion sense and dreams of becoming a Wardrobe Consultant someday! Valerie is also a Psychology student who prides herself for being a non-smoker. The blogger’s sense of style and fashion is superb, and she features adorable pictures of herself and her kittified collections. Princess Miharu’s vibrant personality shines through her posts and they are guaranteed to pepper your day with princess-y charm! She will always be one of our precious SanrioTown princesses! Thank you for your fantabulous posts, Valerie, and stay charming and sweet just like the princess that you are! Blog of the Week: Mrs. Awesome Planet! Just like the recent winner’s blog, Blog-All Stars featured Mrs. Awesome Planet’s blog two years ago as the “Blog of the Week” for her cool blog entries and for sharing with us her life as a mother of two adorable sons! We’re happy to find out that after two years, Mrs. Awesome Planet is still at it! Mrs. Awesome Planet is one of the regular SanrioTown bloggers who writes about modern motherhood and features shopping tips for mommies and kids, fun events and various food trip locations in the Philippines! She’s the proud mother of two boys, AD and JX, and we really feel like we’ve watched them grow for almost three years! She also seems to have a passion for all things yummy as she features awesome restaurant reviews complete with mouth-watering pictures of food! Mrs. Awesome Planet also writes ideas for family vacation and activities that everyone would enjoy. Visit Mrs. Awesome Planet’s Blog: Mrs. Awesome Planet! We’re really proud of our blogger mommy bloggers, and we really thank you, Mrs. 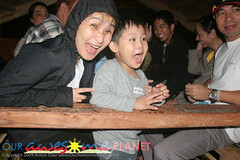 Awesome Planet for sharing with us your awesome life as a mom! Blog of the Week: The Magical Bunny Winx Zone! Two years ago, we featured The Magical BunnyWinx Zone as the Blog of the Week. Today, the SanrioTown team is more than happy and thrilled to find out that BunnyWinx (or Bridget ) is still at it, writing awesome posts and adorably cute blog entries! Bridget prides herself to be a lifelong fan of Sanrio characters such as My Melody and Little Twin Stars! Her blog overflows with magic and charm, and she definitely fascinates us with fancy buttons and images that she made on her own! Bridget has got a large collection of Hello Kitty stuff, from adorably fluffy plushies and fuzzy socks, to stuffed keychains and kittified wallets! Her blog never fails to enthrall us with its cute images and a remarkable color scheme! Bridget’s artistry and sense of style is superb! The Magical Bunny Winx Zone is sure to ensorcell you with cuteness and magic, so visit her blog now: The Magical Bunny Winx Zone! We hope that, by this time, around two years later, she will continue to bewitch us with her blog, and continue to be a loyal and faithful SanrioTown blogger! Congratulations once again, BunnyWinx, and may your days always be sprinkled with cuteness!